Come early come often . Our dealers will be restocking during this month long event. 10,000 sq ft of antiques and vintage unique finds on sale. Vintage jewelry, vintage clothing, Lalique, Designer clothes and handbags, bric a brac, vinyl records…….EVERYTHING is ON SALE! 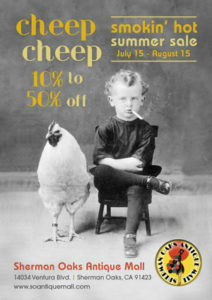 CHEEP CHEEP BARGAINS galore . Shop in air conditioned comfort. Looking for preowned designer vintage clothing ? 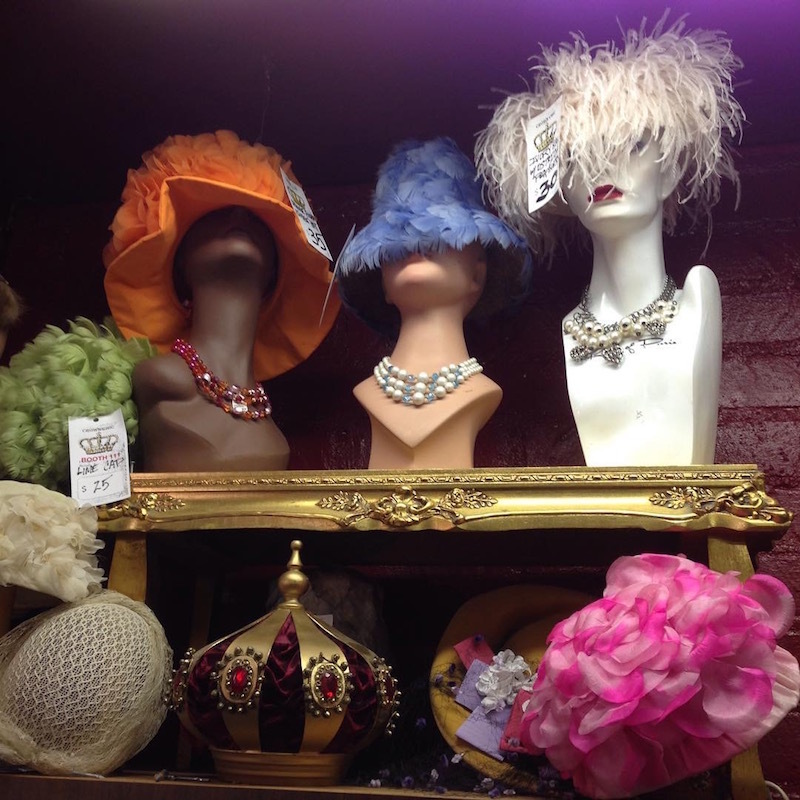 Meet Christian of “Crown Chic”, our fabulous vintage clothing boutique at the Sherman Oaks Antique Mall. In this short video, Christian gives you a tantalizing taste of just a smattering of the preowned luxury designer vintage clothing he has for sale. We don’t know how he can consistently restock his large and varied selection. Come often since his items tend to fly out the door. You’ll find all styles and periods of luxury brands like Chanel, Prada, Gucci, Dior, and Dulce and Gabbana . Christian curates and amazing collection of pre owned luxury vintage clothing, apparel and accessories. He has dresses, suites,, jackets, hats, scarves, designer handbags and shoe. You can create an entire ensemble to go to the prom, a rockabilly concert an important business meeting or a formal event. But don’t think it’s all vintage ladies wear. He has interesting jackets , shirts, ties and hats for the guys too. We honestly don’t know where he gets such fabulous treasures that he can offer them at such reasonable prices. Holiday Party & SALE Dec 2, 3 & 4 Storewide 10%-50% off meet the dealers, wine, food , door prizes & FUN! 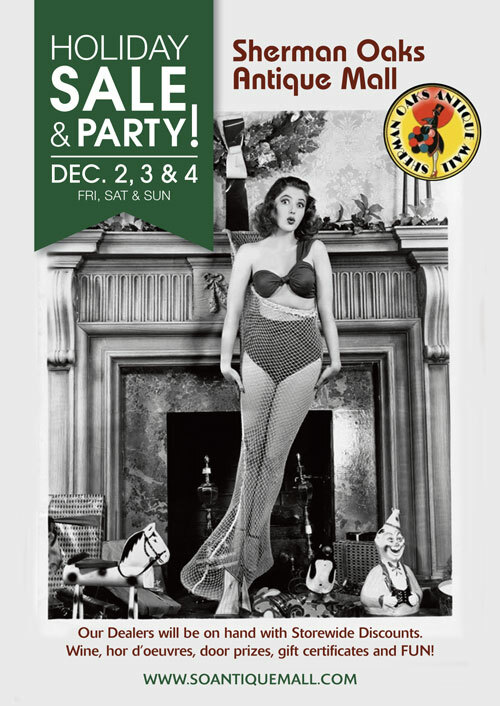 If you’ve never visited the Sherman Oaks Antique Mall, you couldn’t pick a better time than our Holiday Party & Sale Dec 2, 3 & 4. Join in the fun with plenty of wine, munchies, vintage door prizes given away every fifteen minutes. ( Here’s a hint just say you want one and they’ll read your name) and gift certificates to be won. Your favorite dealers are present ( and a little tipsy) so this is the best time to haggle directly and make your best deal. This is our 34th year of the holiday sale and its fun to see generations of families returning year after year for this annual tradition. Take the hassle out of holiday shopping. Remember when shopping for gifts was fun and entertaining. Antique and Vintage Jewelry: all eras , styles and price points of antique and vintage jewelry . One of the best selections anywhere! 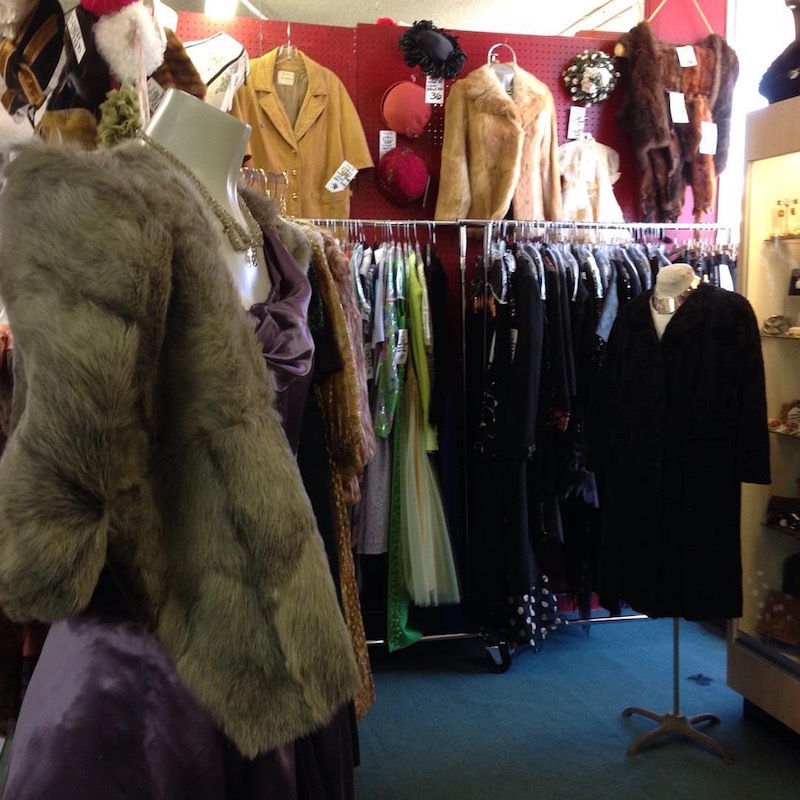 Vintage Clothing & Designer Apparel: includes a wonderful vintage clothing boutique featuring pre-owned designer apparel. Dress up yourselves and your table for the holidays!